Arrive early morning and take the ferry from the Anacortes Ferry Terminal. Take a tour of the ferry, pick your spot, and enjoy the ride. You will dock at Friday Harbor – you’ve arrived! In Friday Harbor, take some time to walk the town. While you are there, stop in at King’s Market. This is a great place to grab a gourmet sandwich, a good wine, your favorite periodical, and more. You’ll find a variety of shops and if you are there on a Saturday morning during the summer, check out the farmers market. On this first night, you may want to try dinner at the Fireside Lounge at McMillin’s. But, before you head out for dinner, stop by the Hotel de Haro front desk and rent a DVD for the evening. If you are in need of snacks (ie. ice cream, popcorn, other…), visit the Country Store, the town grocery. Note: For us, this will have to wait until next time, but make reservations at Duck Soup Inn, it’s just outside of Roche Harbor and is highly recommended by the locals for a gourmet meal. Krystal Acres Alpaca Farm and Country Store – this is a great stop to get out and roam the farm. There are three+ areas where the Alpaca’s roam. Take a few pics and stop in at the General Store. The General Store offers an array of Alpaca goods like scarves, hats, shirts, wraps/blazers, blankets, toys, and more. Two scarves were purchased here. English (British) Camp – Take the trail down to the left and you’ll experience views of the waterfront, garden, and blockhouse…the view is from where the quarters of the generals stood long ago. The formal garden is patterned after the original one planted in 1867 for the captain’s homesick wife. English Camp is situated on Garrison Bay, an ancient home of the Coast Salish people. Lime Kiln Point State Park – maybe my favorite stop of the trip. Lime Kiln State Park offers beautiful views, whale sightings are recorded by/at the lighthouse (or maybe you’ll catch a pod), walk amongst the trees to the restored lime kiln and limestone that was. You may see kayakers paddling by, stay for a picnic, or take that nature walk that you’ve been yearning for. Stop by the gift shop for a map. Truly Northwest. Hike Young Hill (or Mount Young) 650 ft and experience views of the inlets, waterways, Vancouver Island, the Olympic Mountains, and Haro Strait . Victoria BC is just on the other side of the water. Even if you are not in shape, this is certainly doable. While you are up there, take the short intersecting trail and check out the British Camp Cemetery. Sculpture Park – this interesting park allows you roam the acreage, down to the water, past the lake, and into the woods to view various types of art, statues, and the like. My all-around favorite was the easel with a mirror as the piece of art or I guess you could say that “you” are the piece of art. Others I enjoyed was the dragonfly, a spoon tottering, and chainsaw made of wood. If you are looking for sportswear (clothing, jewelry, handbags), stop in and see Roche Harbor Sportswear, you’re sure to find something you’ll like. A stop in at Dominique’s House is a must-see as well. To end the day, have a late afternoon therapeutic massage for two at Afterglow Spa, which is located on the side/bottom level of Quarryman Hall. Enjoy dinner at Madrona Cafe on the deck and if you are visiting in late Spring or Summer, you’ll more than likely experience the nightly lowering of the flags at sunset. American Camp dates back to 1859. There are a few renovated buildings standing. Camas bulbs have been harvested here for over 2,500 years ago; Camas and buttercups highlight one of this region’s last remaining natural prairies. There is a visitor center but it was closed on the day we visited. In the mid-1800’s, Great Britain and the United States settled ownership of the island through peaceful arbitration. This island is full of interesting history. One thing I wanted to note about this area, at both the American and English Camp, were the number of caterpillar nests in the trees on the property…fascinating. A stop at Cattle Point Lighthouse is enlightening in that you get a whole different view from this side of the island. This side has vast sea views, rocky cliffs, wheat colored grasses, wildflowers, seagulls and you might even see a river otter. In order to get to the lighthouse here, we parked at the Interpretive Center down the street and walked to the trailhead up the street. Stop by South Beach while you are in area as it is a beach with driftwood, beach rocks, beach grass and of course, sand. Walk the beach, cook s’mores at the already present fire pits, or take a seat and read a book while letting the sand flow through your toes. You’ll see ships and sailboats there and yonder. It’s amazing how much was seen in the two full days (three-day weekend) on San Juan Island. It’s time to head back to Friday Harbor to get in the ferry line for the mid-afternoon sailing. Depending on how much time you have for a wait, you can either stop by King’s Market to grab a sandwich for the car/ferry or try out a restaurant in town that is waiting for you. All and all, this is a great trip to consider, whether it be for a honeymoon, anniversary, recreational weekend away, first time visit to Washington State and more. And if you are staying a bit longer, you’ll want to take the inter-island ferry to visit a different island within the San Juan Islands chain, perhaps Orcas Island. There are many things to do in the San Juan Islands such as whale watching tours, kayaking, biking, camping, glamping, and of course boating. 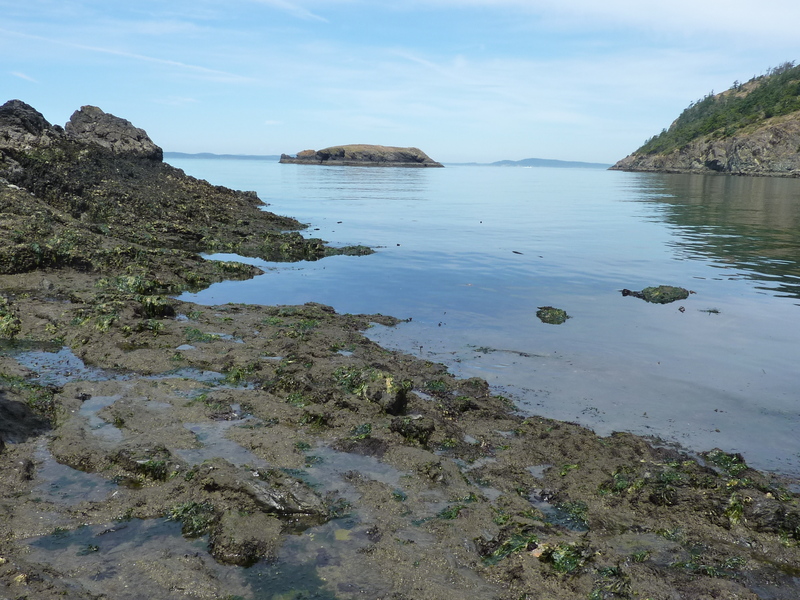 One could write a book about living and experiencing the San Juan Islands…and they are out there. Washington State Parks turn 100 years old this year. It was March 19, 1913 that the Washington state park system was established. It’s their Centennial and events are planned throughout the year. How many state parks are there in Washington? 117 according to http://www.parks.wa.gov/ and 186 if you’re looking at http://www.stateparks.com/wa.html. So many to see, so much to do. Whether it’s hiking the trails, picnicking, camping, taking in the views, and the list goes on. There are those parks along waterways, in the desert, on an island, in a forest, near a lake or river. Do you have a favorite? My favorite would be Rosario Beach/Deception Pass. And you know, I have not been to nearly a quarter of them, so guess what, we have a lot to see. How can you help keep the Washington state parks up and running? Help support the Parks by donating, purchasing a Discovery Park pass, and accepting the $5.00 Parks fee when you renew your license tabs each year. LeMay – America’s Car Museum just turned one year old! Happy Anniversary! It’s located near the Tacoma Dome on 2702 East D St. There is a beautiful variety of automobiles from the early 1900’s on. And if you aren’t a car buff, you’re sure to enjoy. ACM (America’s Car Museum) has four levels with ramps on each side, all filled with automobiles (of sorts) and don’t forget to check out the walls there for interesting information, whether it be the history of Ferrari or how a “green” car is made. The Indy 500 collection just opened in June. And my goodness, opening August 9th is “60 years of Vette” – now this will be a must see! Besides the cars on display, the building also contains the Museum Store, Classics by Pacific Grill Cafe, and banquet room for that special event on your calendar. The Museum also showcases a number of fun as well as educational areas, like the State Farm Theatre, Auto Care Center, and ACM Speed Zone – try your hand at racing in a CXC simulator or on the slot car track – this can really add to the overall experience. And check out the ACM website to view upcoming events, like the Vintage Motorcycle Festival and the Summer Drive-in Movie Series. Interested in what the collections are located here? The four levels contain the Harold E. LeMay Collection, Custom Coachworks, British Invasion, Nicola Bulgari Collection, Indy 500 Racing, Ferrari in America, Alternative Propulsion, and Collection Galleries. The collections will change periodically, so more than likely you will want to visit again. Check out a number of my favorites below. A day of Tacoma was made of it as a stop was made at Frisko Freeze as well as a Tacoma Rainier’s baseball game. Frisko Freeze first opened in 1950, and still looks like a drive-in (of sorts) of the 50’s. Frisko Freeze has a drive-thru window and limited parking. The seating is outdoor only… in your car, on the curb, on a bench. It’s seen a lot in the 6+ decades. The prices are low and the reputation of tastiness still privales. What was ordered? Onion rings, French fries, a large pop, cheeseburger and double “beefburger” with cheese. And the favorites were? Onions rings! And what to try next? a blackberry milkshake. There are 8+ kinds to choose from. And if you want a Malt instead, choose one. Not only do they have burgers, they also have a fishwich, shrimpwich, corn dog, fish and chips, and more. Frisko Freeze is located at 1201 Division St., Tacoma, WA. like mist rising from the hillside. Skokomish, Skykomish . . . all the ish rivers. where many rivers run down to an inland sea.